One of my biggest fears when I embarked upon this journey was that I would be lonely. But there have been very few times that I’ve had that feeling of loneliness. I’ve met really interesting people along the way and I’ve always felt that I’m in close touch with my friends and loved ones. With cell phones, Facetime, Facebook, Twitter, text messaging and my blog there are many ways to stay in touch. Most people are shy about leaving comments on a blog. Don’t be shy. It’s the interactive aspect of blogs that make them so popular. I’ve also received a lot of emails and they’re really appreciated. I’ve received emails from my brother out West letting me know that his family reads my blog every day and he keeps me updated on his family. 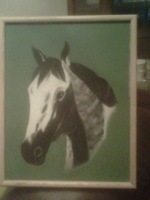 Perry sent me the lovely art work from my neice Hannah. 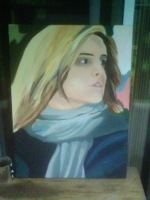 She’s so talented. My brother Cliff in Pickering sends me notes of encouragement and promised to cook Bison for me (he’s a great cook. I’ve received emails from our friends Ray and Elaine, and Cecile and Brian telling me how much they are enjoying my blog and encouraging me to continue. Vicki forwarded me a message from my cousin Brigitte in Germany informing us that her niece Sandra won a gold medal in the special Olympics. Fantastic! I also received many emails from colleagues at work. Viviane’s mom offered me a place to stay over night in Ignace. Anthony gave me great recommendations on places to stay. 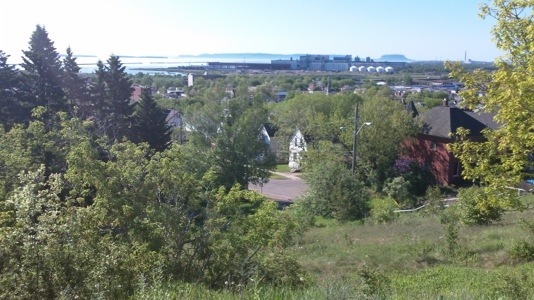 Donna told me about Fort William in Thunder Bay. And there are many more. But my favourite emails are from my Vicki, love letters really, telling me about her experiences while she was on a cruise with her mom in the Mediterranean. There was a pretty massive 10 hour time difference between us. I would fire off an email in the evening and I couldn’t wait to wake up to her reply early the next morning. Vicki would regale me with the sights and sounds of such places as Santorini and Mykonos. Meanwhile I would tell her about climbing the Rogers Pass, Revelstoke, Golden and the fantasticaly interesting people I’ve met along the way. One thing we always had in common wasn’t the water or the rocks or the trees or the historic buildings but rather the amazing people we met along the way. When I get back I plan to pull out everyone of those letters because they keep me pedalling day after day and they have come to form the colour and fabric of this journey. The two cyclists I met outside of Fort Frances told me that there was a great place for breakfast in TB. All they knew was that it was on Algoma St. I figured there was a fat chance of me finding the place, but it’s worth a try. “You mean the Hoito” responded one stranger when I asked. So there I went. Hoito means “care” in Finnish. When in the city young Finnish bushworkers had difficulty finding a decent meal at a fair price. I had an excellent eggs, pancakes and bacon breakfast with coffee for under $10. I spent the rest of the day at Historic Fort William. Hotel rooms were in short supply because of the flooding (the Super 8 was completely shut down) and Donna have me a strong recommendation to see Fort York and I noticed they have camping. But a great way to spend the day. 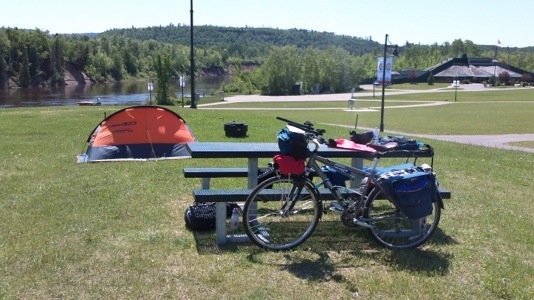 So I cycled the extra 15kms and set up camp. It turned out that I was the only one there. For the entire night. It was a little lonely, but very peaceful. 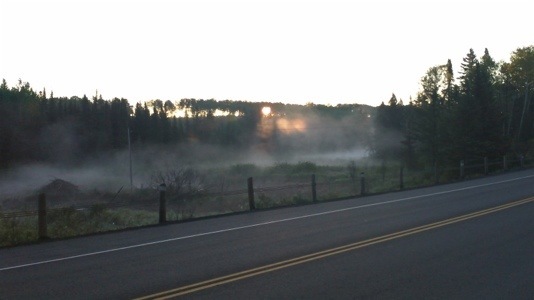 I woke up the next morning to geese outside my tent and a deer within a 100′ of my tent. Fort William is fantastic. You’re give a tour by actors in period costume. Fort William was a Northwest Company trading post. 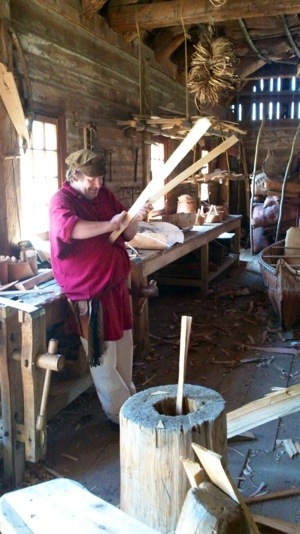 Each year a 1000 or more voyageurs come from all around for the “rendezvous”. We were a little early but none the less we were greeted by Kenneth McKenzie, a cousin of the famous explorer, and wife gave us a tour if the facilities. The two most interesting buildings were the apothecary and the canoe shed. With regard to the apothecary, apparently my black feet indicated foot rot and they would likely need to be amputated. But at least I didn’t have a toothache. They device they use to do a root canal looked particularily evil and they waste costing pain killers on such a simple operation. 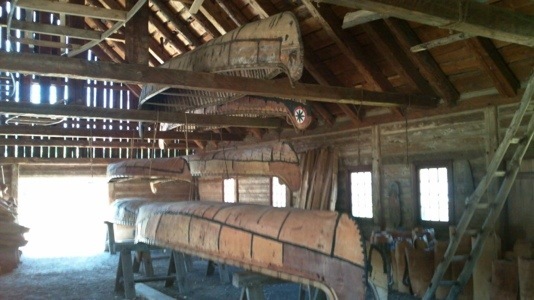 At the canoe shed they construct birch bark canoes. They had two under construction and several hanging from the rafters. These are massive canoes, enough for 12 voyageurs and goodness knows how much cargo. 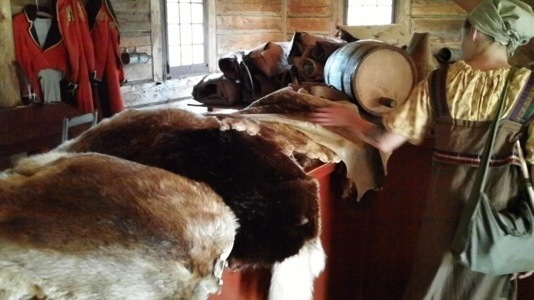 Each voyageur was responsible for two 90lb packs of fur amd if they lost one it came out of their salary. The food is really good there too. I had an early dinner – beef stew with fresh baked bread – so they I wouldn’t have to cook. I should also mention they served Rickard’s Red. The thing that impressed me most about Fort William is the authenticity. 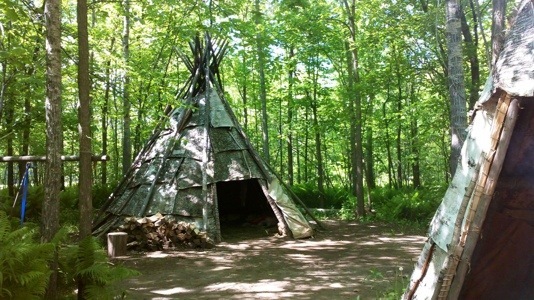 They actually make 90lb packs of fur, they make the canoes from birch bark and use spruce root for twine. Everything is real. By the way, if you have something against furs you should skip this place. 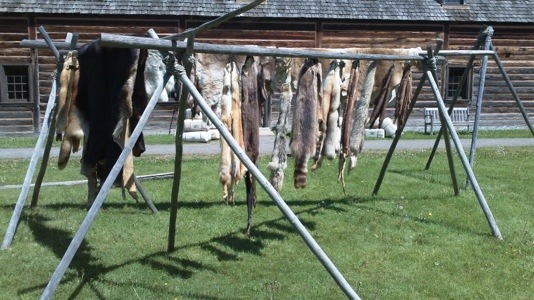 There are hundreds of furs: beaver pelts, seal skin, timber wolf, wolverines, skirls, muskrat, fox, mink and on and on. 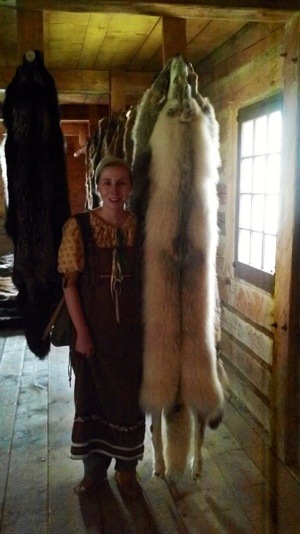 The photo below of Kenneth’s wife beside a fur is a timber wolf. It’s bigger that she is. It would be very scary to meet one of these animals. I’ll talk briefly about my ride into TB this morning. 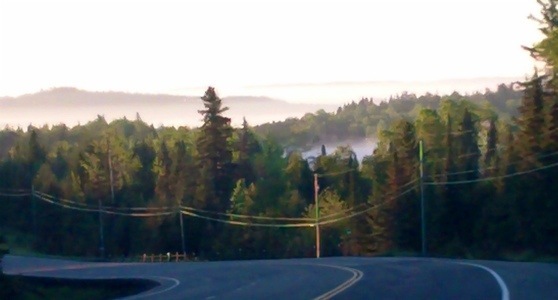 I woke up at 6am, hit that busy stretch of the Trans-Canada, and took that awful detour on 102. There’s no point in talking anymore about it other than there were some outstanding views coming into TB, and I got another flat. The cause of this one was easy to find: a big staple stuck in my tire. I need to be on my way so I’m just going to attach some pics and you can figure out where they belong. I’ll probably sort it out later. Update: I was very excited to learn that the NorthWest Company is still alive and doing very well.